The new study confirms findings that are well known to some East Coast communities, particularly Norfolk, Virginia, home to the world’s largest naval base. According to a report by The Washington Post last Sunday, Norfolk has spent the last several years battling storm surge made worse by sea level rise. Some have proposed buying up property in flood prone areas of the city to move people back away from the encroaching sea, while spending hundreds of millions of dollars in other parts of the city to build flood walls, tide gates, raised roads and flood pumps to protect critical infrastructure, including the Norfolk naval station. “Along the southeast coast, other cities in Virginia, Maryland, North Carolina and Florida are monitoring Norfolk’s response to the flooding, knowing they could soon face similar challenges,” The Washington Post reported last Sunday. “Low-lying Gulf and Pacific coast cities are also watching.” The new study from the journal Nature Climate Change should generate some increased sense of urgency and (hopefully) better coordination among vulnerable cities to share climate adaptation strategies. The new study should also inform regional and state disaster response planning efforts, particularly among state national guards on the East Coast that may be charged with responding to more frequent and intense floods in vulnerable coastal communities. As many states continue make tough budget choices about how to resource their national guards over the next several decades, developing the techniques and providing the assets to respond to coastal inundation may become a greater priority for East Coast states. 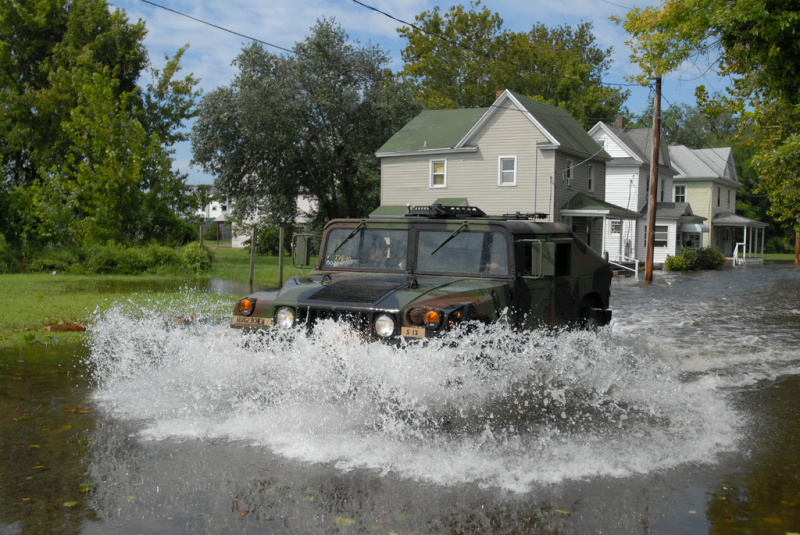 Photo: Maryland National Guard soldiers provide support to law enforcement agencies in Salisbury, Maryland in the wake of the August 2011 Hurricane Irene. Courtesy of The National Guard.